Water Rat Number 537 - initiated on 29 April 1956. Les Henry (Henry Leslie) was born in the East End of London in 1920 in the height of the Depression. His parents were in the rag trade. His passion for the harmonica was aroused when he heard the legendary Larry Adler play. In his usual comic vein he would tell his later audiences that "my mother was deaf in one ear, and I got a mouth organ and used to blow a little song in her ear. The song was terrible, but she'd say, 'Oh that's lovely'." 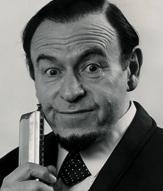 At the age of 19 Les won the solo harmonica competition at Butlins holiday camp in Clacton. His prize was a new harmonica presented by Larry Adler. All Les could say was, "He shook my hand and that was one of the greatest thrills I had." During World War II, he served as a motorcycle dispatch rider bur also toured with the Combined Entertainments, sharing the stage with performers such as Harry Secombe and Spike Milligan. "I did a show in the army hospital in Naples where a bloke laughed so much he split his stitches." Les recalls. After the war Harry and Spike asked Les to join them on a new radio show, which was to become 'The Goons'. Les turned them down as he had already agreed to form a harmonica act - The Three Monarchs - with Erik York and Jimmy Prescott. The trio's show really took off when they introduced comedy into the act. "I did no more than my funny walk, and silly things, but it was an instantaneous success - it's as if God smiled on us." In 1952 the Three Monarchs performed in the first Royal Command Performance of the new Queen's reign. One of Les's memories of that show was during the rehearsal when Gracie Field sang " God save our gracious King... er... Queen" much to the hilarity of the rest of the cast. Happily, she didn't make the same mistake on the night. Into his early eighties Les was still doing various shows as well as continuing to perform in many Charities shows. "I've got a gimmick, I work cheap," he would quip.